This is the grandest villa of the Riviera. The Villa Pisani Nazionale di Strà was built in the 18th century commissioned by the rich and prestigious Venetian Pisani family, owner of numerous estates in that area. The works were begun as early as in 1735 and had been commissioned by doge AlmorÚ Pisani to the Padua architect Girolamo Fringimelica who, however, only carried out the stables and a number of decorations in the garden. In fact, the real project was completed by architect Francesco Maria Preti. The building has a rectangular layout with two inner courtyards divided by a colonnade supporting the majestic dance hall. The villa presents with an extraordinarily imposing facade: the central body is spanned by a balcony supported by four monumental caryatids. There are eight Corinthian-order half-pillars rising from the balcony. There is also a cornice decorated with a flowery festoon supported by puttos from which a triangular gable decorated with statues rises. The architectural elements and the baroque ornaments of the park, the stables and the turrets scattered along the fence are more dynamic and articulate. A recently-built long pond runs straight along the northern facade of the villa. Two sumptuous wrought-iron gates on both sides of the villa open the way to the park. Close to the right wing gate there is a marble statue of Apollo sculpted by Giovanni Bonazza about 1718. In the park, at the centre of a mound, there is the "casa dei freschi", that is the ice-house designed by Fringimelica. In the north-eastern direction it is possible to observe the fence and the entrance to the orangery. In front of the villa, beside the long pond, there are the stables which represent Fringimelica's most important work in the park. The interior comprises a central body marked by an entrance hall and by a dance hall developing on a double height and flanked by two small halls. The first floor is reached by means of a staircase whose ceiling is decorated with an "allegory" by Jacopo Guarana. The rooms are all intercommunicating though disengaged from each other thanks to a corridor running along the perimeter of the two courtyards. 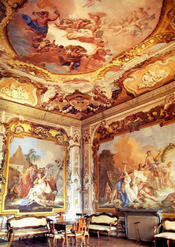 The first room presents with a ceiling carrying a fresco representing the "Triumph of the Arts" by Crostato. The next room has completely fresco-decorated walls with panels rich in ornamentation and scenes illustrating the myth of Bacchus. The "Triumph of Bacchus" on the ceiling repeats the typical pattern of the apotheosis of the deity, whereas the "Bacchic Scenes" of the walls are brightened by landscape elements. The decoration was carried out in 1770 by Jacopo Guarana. The next three rooms have Empire style furniture and are followed by the room of the dogi with marble busts of the dogi and other relief scenes. The adjacent room presents on the ceiling the "Arraignment of Paris", a canvas painted by Jacopo Amigoni. 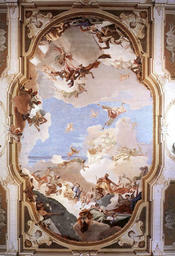 The room of Virtues presents with a ceiling decorated with a canvas by Jacopo Guarana which represents the "Virtues" whereas the walls are covered with canvasses depicting the "Liberal Arts" painted by P.A. Novelli and G. Diziani. The ample hall decorated with frescos has the walls painted with pillars, producing a perfectly working plastic effect and outlining dummy architectural elements that surround the central work depicting the "Glory of the Pisani family". The latter represents the members of the family surrounded by allegorical personifications of the Arts, the Sciences and the Geniuses of Peace, before Power and beneath the Virgin observing with benevolence Fame explaining the glory and the power of the Pisani family to the world represented by the continents. This fresco was painted by Gianbattista Tiepolo between 1760 and 1762 before he left for Spain. The banquet hall presents with remarkable monochromatic decorations on the gallery painted by Gian Domenico Tiepolo and with the brass gates at the doors which have been attributed to Giuseppe Casa. In the approximately 10 hectares of the park of the villa Pisani there are the main buildings of the park. First of all the stables, an imposing perspective backdrop and a theatric scene, with its curved wings that improve sonority, essential to characterize the equestrienne inspiration of the park à la Vitruvio. Another symbolic element that must have been one of the first realizations is the labyrinth, originally planned as circular and inspired, with its turret served by a double helix that leads to the statue of Minerva, to a ritual conquer of wisdom. The character of a game is reflected by the presence of a hiding place, by the possibility of meeting the others again while walking through the labyrinth in illusory frames that recall paintings and sculptures and by the peculiar hexagonal exedra with curved sides, where a winding staircase leads to a belvedere with a round window that allows those who are downstairs to see, like in a painting of Mantegna or Coreggio, who is upstairs. The exedra is also the center from where many of the perspective axis start, that have on the other end the citrus orchard, the sculpture groups of Bonazza and the fencing portals, among which the most interesting one is the one called "of the Belvedere", characterized by a double slope, around gigantic columns, that leads to the suspended crowning path. Also those realizations that are more tied to a practical use, like the houses of the gardeners beside the exedra and the tea time lodge with the ice-house underneath, participate to the theatricality of the complex, that is strong enough to transform the former in a light green backdrop and the latter in a artificial hill surmounted by a little palace. Only the greenhouses completed in the first half of the 19th century, present, with their technological refinement, an austerely utilitarian character. With the collapse of the Serenissima the villa was sold to Napoleon who donated it to the Viceroy of Italy Eugenio Beauharnais. In 1814 the villa fell into the hands of the Emperor of Austria and in 1866 in those of the Savoy family and was finally ceded to the public domain in 1882.